FBI Director says hacking has "mushroomed into full-blown economic espionage"
Hacking, which used to be something people did for "fun or for bragging rights" has mushroomed into something else entirely over the past dozen years, FBI Director Christopher Wray said at a cybersecurity conference in Boston Wednesday. As Americans now "live much of our lives online," we're more vulnerable, Wray noted. And the threat "is coming at us from all sides." "What was once a comparatively minor threat – people hacking for fun or for bragging rights – has now mushroomed into full-blown economic espionage and extremely lucrative cyber crime." It's a far cry from when Wray left the Justice Department in 2005, when, he said, "'Tweeting' was something only birds did." Wray said the FBI is now seeing more computer hacking attacks by other countries. "We're seeing an increase in nation-state sponsored computer intrusions, intrusions like last year's massive WannaCry ransomware attack, recently attributed to North Korea. 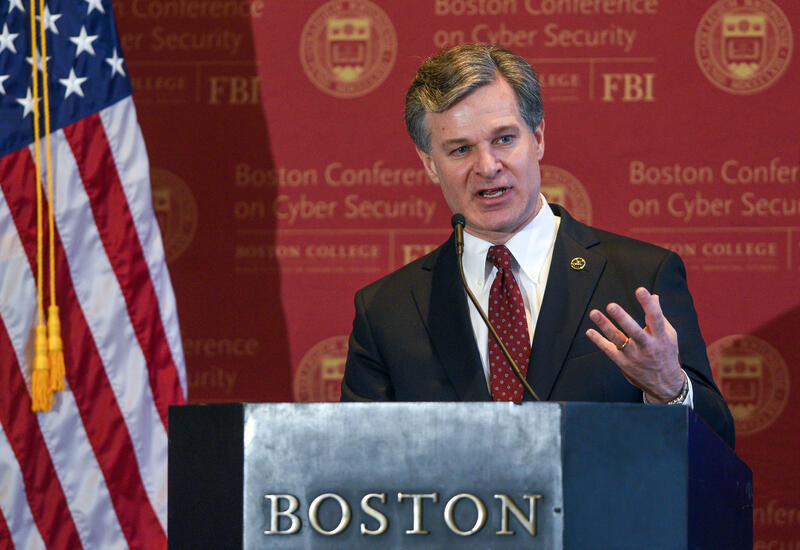 Or NotPetya – the most destructive and costly cyber attack in history," Wray said during a keynote address at a Boston cyber security conference. "Launched by the Russian military, NotPetya resulted in billions of dollars in damage across Europe, Asia, and the Americas." "We've also been seeing a "blended threat" – nation-states using criminal hackers to do their dirty work," Wray added. "We also see Nation-state turning to more creative avenues to steal information." To counter these rising threats, Wray told the group that the U.S. has white-hat cyber action teams, "highly skilled agents and experts who can deploy at a moment's notice, much like our Counterterrorism Fly Teams do." These cyber task forces are "in every field office that respond to breaches, conduct victim-based investigations, and collect malware signatures and other actionable intelligence." They are, he said, "parallel" to the Joint Terrorism task forces. But Wray also acknowledged the shortage within the bureau of qualified cyber-trained agents. "We've come to the conclusion we need to not only recruit better from the outside -- we need to bolster our training inside the bureau to give more of our agents and analysts the skill set and experience they need to work cyber cases," Wray said. Another recurring topic - smart phones that lock out the FBI, which Wray referred to as a "going dark" problem, Wray said that last year, the FBI alone was not able to access the data from 7,775 devices. "Each one of those nearly 7800 devices is tied to a specific subject, a specific defendant, a specific victim, a specific threat, and specific human beings." And this, he said, impacts "human trafficking, counter terrorism, counterintelligence, gangs, organized crime child exploitation and cyber." Andres Triay and Clare Hymes contributed to this report.